From a legal standpoint, the “science” supporting vaccines is already settled. To go after this powerful monopoly in the Courts would require years of tedious litigation, inevitably resulting in a protracted stalemate. 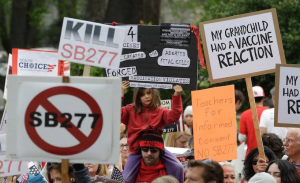 Challenging the minutiae details of SB277 might produce an injunction or some degree of compromise, potentially stalling all-out implementation of the Bill. However, we are placing our families at the mercy of a judge’s discretion. 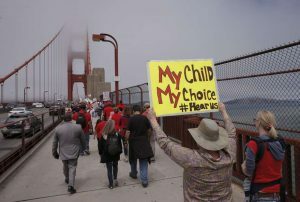 Why traverse this minefield, knowing, full well, the odds are pre-determined, rigged in favor of a pro-vaccine decision? More importantly, upon entering the legal arena, engaging these “authorities” from a constitutional standpoint, we’ve just technically agreed to forfeit our inalienable right to self-determination of the body; by asking permission to opt out, thus playing into the Government’s hands, emboldening their position. All vaccine exemptions (medical, religious or moral/philosophical/personal belief type) will lead to entrapment, because they transpose an inherent human RIGHT into a PRIVILEGE, on the presumption that, by agreeing to the terms applied, you acknowledge and thus sacrifice your natural born “freedom of choice” to an external authority. Since when do we require a permission slip to determine the health of our children? Eventually, they’ll eliminate any loop-holes and introduce a stricter brand of legislation, guaranteeing a gradual stranglehold on our basic freedom, with no way out. This model fits the very definition of a totalitarian state. It is our responsibility to ensure such a bleak eventuality never comes to pass. Future generations are depending on us to take charge and end this mounting crisis before it’s too late. Remember, your Government has pushed us to this precipice, against our will, by imposing a series of unlawful tactics, meant to divide our community. We must, therefore, do everything in our power to resist the systemic rise of medical tyranny and restore our independence. 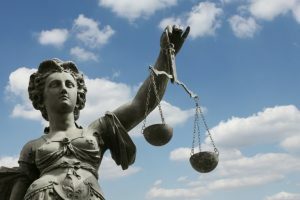 In order to meet any formal challenge in the courts, and succeed, legal council must prove the illegitimacy of so-called “Herd Immunity”, the illegitimacy of the very science supporting vaccine uptake. We have to overturn the entire infrastructure of the Medical Industry, exposing decades of Media and Government capitulation, demonstrate the illegitimacy of the CDC as a regulatory body (in conjunction with the over-reaching influence and corruption of the World Health Organization); further, to provide evidence that, in point of fact, our communities are far better served by adhering to the science of Natural Immunity and nutrition-based Holistic Health. In short, we will be required to prove, beyond a shadow of a doubt, that any justification for imposing vaccine mandates is not only unlawful, but poses a legitimate health concern or “imminent threat” to the individual and the greater community. Once this benchmark is established, a cautionary seed is planted. We will have legal precedent with which to counter any further attempts at mandating vaccination policy on our communities, encompassing similar legislation designed to challenge our basic, fundamental freedom-of-choice to abstain from vaccines, in general, as families living in the community. Isolation is not the answer. 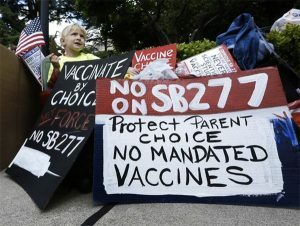 California could consider forming a sector of public schools across the State exclusively tailored for vaccine-free children. There are, conservatively, tens of thousands of eligible children ready to fill these seats. Likewise, we could create teaching circles in every community, for those families unable to connect with alternative schools. This is an extension of the home-schooling model, where-by parents can band together, to share the load of teaching, through contributing a variety of expertise to the curriculum. But why run and hide, when we’ve done nothing wrong? Enough is enough. 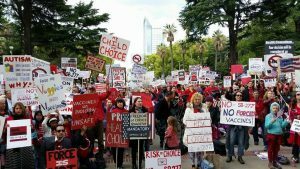 California’s Medical community has stated unequivocally, their opposition to the fascist vaccination mandate SB277 targeting school children. 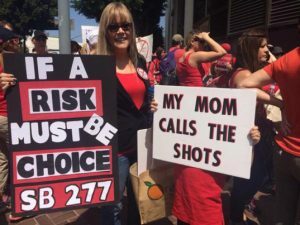 By defying the health concerns of California’s Nursing personnel over vaccine safety, State Governor Jerry Brown is not only proving himself a coward, but an immediate threat to the entire California community. What realistic alternatives are we left with? Non-compliance on a mass scale, the likes of which our communities have never been seen before. This will require widespread community resistance, a force majeure of strength-in-numbers. We have to disrupt the infrastructure of Government until they take notice, and compel them to withdraw their manufactured list of demands. Whether that means wildcat-type strikes, open rebellion by doctors and nurses, school teachers, and education system administrators, disruption is the key, through whichever peaceful means we deem necessary. Parents need to be seen as the spearhead, leading our grassroots revolt. This is essential. Mainstream Media hounds will typically flock to a civil uprising of this sort, so we must utilize that momentum to build and sustain our campaign. The overall message has to be strong throughout, and the support, unanimous. There is no question we are entering a period of uncertainty, with a difficult year ahead. Some families have already made the tough decision to leave California; a drastic measure, albeit understandable given the current climate of distrust. 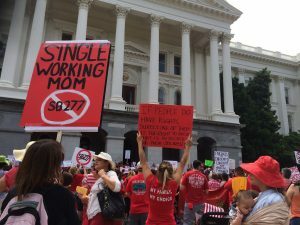 Most are hunkering down, scrambling to find temporary alternative placement for their children, in the hopes that SB277 will be scuttled before it fully takes effect. The political firestorm this controversy has generated, coupled with the massive protests underway since its inception will spark a world-wide revolution in health awareness, based on the determination of our actions. 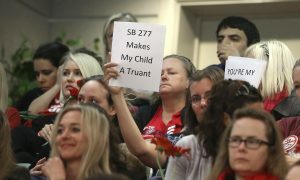 SB277 is just the next stage on a one-way road to tyranny. Rest assured, in the end, we will defeat it, and bring down the forces responsible for drafting this bitterly contested legislation. We all knew this day was coming. The pro-Holistic Health movement has been under fire for generations now. We must seize this golden opportunity at galvanizing our communities, and take that brave step toward embracing complete self-sufficiency. The Emperor has no clothes. The Vaccine Industry is broken, a cornered rat on its last legs. The tactics being instituted in California were designed to frighten us into submission. In the absence of genuine health freedom, legislators will see fit to utilize authoritarian measures on any faction of the population with impunity. Voluntary consent is a defining criteria of any open society. There are numerous historic charters which have laid down the parameters for preventing any infringement on this sacred ground. The imposition of mandatory vaccines would thereby forfeit the legality (lawfulness) of these formal declarations, thus rendering our bodies the property of the state. Are you ready to accept that fate? We, the people (not our elected government) are the genuine leaders and role models of our communities. Allow the voice of your ancestors to be your guide. Embrace their warrior spirit from within, and may natural immunity serve you well through these trying times ahead.